Alternative wine packaging – what is it? Up until the mid 1960’s wine pretty much came in a glass bottle with a natural cork stopper. So it was pretty alternative – and innovative and creative – when Thomas Angove, winemaker for his own winery Angove in Renmark, South Australia – took William R. Scholle’s invention of a plastic bladder in a cardboard box and put his wine in it to sell to wine drinkers. Thus the beginnings of alternative wine packaging, the next phase beyond the glass bottle and cork, amphorae, wineskin, barrel, and tank. Alternative wine packaging – why do we need it? It offers clear benefits over glass in terms of convenience, environmental impact, and usability (where, how, and how much). Glass is strong, resilient, and a good insulator – all good for wine. But it is also heavy and breakable, the latter issue with some safety concerns if in public areas. Cork, too, has been a trusted stalwart of wine packaging, providing an elastic stopper that can keep a bottle closed and protected for extended periods. Glass bottles with cork stoppers can keep wine preserved while it matures gracefully for decades in some instances. But cork is a natural product, and has its noted failures as well; it can sometimes taint a wine’s aroma and flavors with a musty impression, and it does become brittle with age, heat, or excessive moisture. What wine drinker hasn’t had a cork break or crumble when trying to pull it? And last, that bit about pulling it; a glass bottle with a natural cork stoppers needs a tool to open it. And again, what wine lover hasn’t had a delicious bottle of wine … and been caught without the all-necessary corkscrew to open it? Not many of us have sabers on hand in that instance either. All other beverages (except some Luddite beers) have long since moved on to packaging with screw caps, twist offs, pull tabs, and push tabs that need no third-party gizmo to open. Freshness – whether single-serve, wine keg, or bag-in-box, alternative wine packaging promises a fresh glass of wine at the time. Glass-and-cork packaging won’t ever disappear completely; there is no better packaging for aging wine. Furthermore, alternative wine packaging isn’t good at handling bubbly; the pressure in sparkling wine is too great for most (cans and aluminum bottles an exception). Besides, nothing is more festive than the pop from a bottle of sparkling wine. This website is designed to offer information to wineries, wine wholesale distributors, wine merchants, wine shops, restaurants, clubs, bars, and wine drinkers on the benefits of alternative wine packaging, and how it incorporates into our contemporary lifestyle. Hopefully, though, one day, such packaging won’t be considered alternative any more. Common wisdom in the wine industry is that 70-90% of all wine bought is enjoyed within 24 hours of being purchased. Most wines would benefit from the convenience benefits alone of alternative wine packaging. When the day that alternative becomes commonplace, we can all then focus on the creative and innovative! 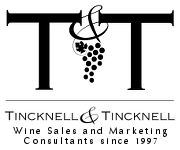 Tincknell & Tincknell, Wine Sales and Marketing Consultants, provide strategies, consultation, and services in wine sales, wine marketing, branding, and technology to wineries and wine related businesses. We help wineries compete in the burgeoning, global wine industry with creative, new, business techniques, building brand equity, innovative marketing, and applying today’s technology effectively.